Cassette in an edition of 500 copies. 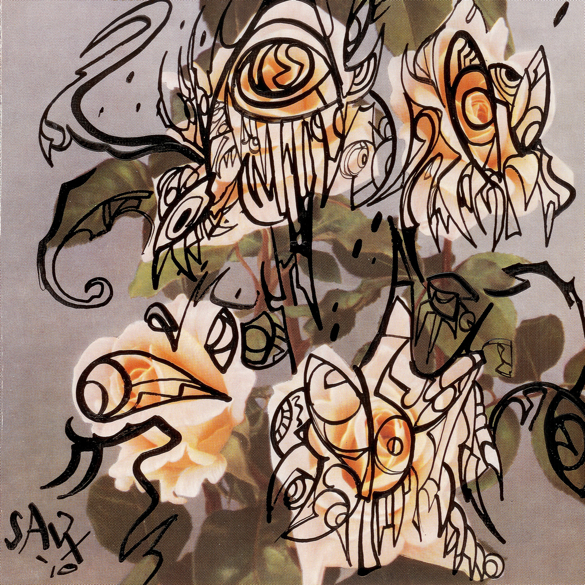 Cover: ‘Dead Flowerz One’ – the first in a series of six by SAVX. Well this is a tad awkward. We don’t currently have a working cassette player in the office, and so the contents of this latest Ash International from BJ Nilsen outing remain something of a mystery to us. As you’ll probably realise, Nilsen is a bit of a favourite around here, and so it’s not a particularly big stretch to suppose that this is well worth acquiring. The A-side features a forty-minute live set recorded at the ICA in London during May 2008 while the B-side boasts another live document (this time clocking in at just over half-an-hour), recorded at Puzzle, Caen in November 2008. Rumour has it that renditions based on his 2007 long-player The Short Night feature prominently, inter-woven with other non-album elements, which all sounds very promising. For what it’s worth, here are the liner notes/performance guidelines listed on the release: “Arrive early. Dress appropriately. Avoid excessive alcohol consumption. Tune up before and during the performance. Don’t be a statue. Avoid “dead air”. Be flexible. Learn to play through bad stage sound. Never stop part way through a song, no matter how badly you’ve screwed up. Be prepared to socialise and mingle with the audience members. Have fun.” Limited to just 500 copies and housed in great SAVX (aka Savage Pencil) illustrated artwork. By now, most faithful aQ list readers are quite familiar with Swedish sound artist/field recordist/musician BJ Nilsen, we’ve heaped praise on most of his records, each a dark delicate balance of strange haunting sonic landscapes, and deftly manipulated sound, drones and textures and abstract explorations of sound, from the macroscopic to the micro, from thick sheets of rumbling low end thrum, to hushed crystalline chimes, to barely there snippets of found sound, to charged stretches of barren electronics. This super limited cassette gathers up two live performances from back in 2008, both gorgeous examples of Nilsen’s delicate and expressive soundscaping. Barely there shimmers, strange animalistic croaks and grunts, shimmering ultra delicate sine wave skree, deep whirling almost industrial sounding thrum, swoonsome stringlike melodies stretched into yet more layered drone, shards of muted glitch and crackling buzz, smeared into gauzy clouds of soft focus haze, the sounds whirling dizzily, druggy and drifty and dreamy, lush almost sci-fi cinematics, draped with softly crumbling melodies, and fragmented streaks of grinding high end, all woven into a surprisingly lush chunk of blown out dreamdoomdronemusic, a bit shoegazey, a little ethereal, but still rife with mechanical whirs and strange bits of found sound, samples and other sonic detritus, that makes it sound a little like a Philip Jeck performance, all warped and warbly. Whew! Fantastic stuff, not surprisingly, and most likely super limited, so grab one pronto!